The C&C Girls headed to Hamilton, ON last weekend to check out the latest health science Osteopathy at the Canadian Academy of Osteopathy. Like most, the girls didn’t know the health benefits it provides for women but also how it differs from Chiropractic work. There were so many health benefits that aid in the female productive and digestive system helping those with IBS, to relieving menstrual pains and conception. To put the topic to the test C&C Girl Jessie Sulidis received treatment from School owner and operator Rob Johnston. Not only did he provide a comedic and friendly performance but he completely helped Jessie with her digestive issues and realigned her body structure that had been twisted and deformed from years of competitive dance and gymnastics. Almost immediately Rob was able to determine Jessie’s ribcage pain whilst dancing was due to a dislocated rib which is put back into place. He then realigned her digestive tract with alleviated a lot of the stomach pressure she had been suffering from. This is definitely something to try if you are experience similar symptoms as prolonging this type of work can lead to severe health problems down the road. Check out the interview we conducted with school owner Rob Johnston to find out more about osteopathy and how you can enroll in the program! Starting salary for graduates is around $100,000.00. Definitely something to check out. 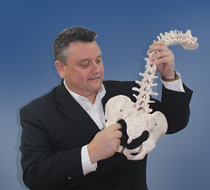 How does Osteopathy differ from Chiropractic work? What are some benefits Osteopathy can have for women? What’s the success treatment rate? OSTEOPATHY IS VERY GOOD AT DEALING WITH ACUTE MUSCULOSKELETAL PROBLEMS OR IN THE TREATMENT AND MANAGEMENT OF CHRONIC DISEASES. MAJORITY, IF NOT ALL, OUR PATIENTS HAVE SEEN RESULTS IMMEDIATELY! DEPENDING ON THE PROBLEM, IT MAY TAKE MORE TIME TO CORRECT THE ISSUE AT HAND. Tell us why aspiring students should attend The Canadian Academy of Osteopathy? What type of career and salary is expected of an Osteopath and what genres can one break in to?